North Irish Lodge is a 5 star barn cottage NITB approved dating back to 1850 and beautifully restored to maintain much of the rural charm of a bygone age. The cottage offers all the mod cons you’d expect from 5 star luxury including free wifi, open log fires and a DVD library. As well as providing top notch accommodation this Islandmagee based company also offer a range of Sea Tours in their 12 passenger RIB boat the North Irish Diver including guided tours of the fabulous Gobbins Cliffs as well as Golf and Whiskey tours to areas further afield. 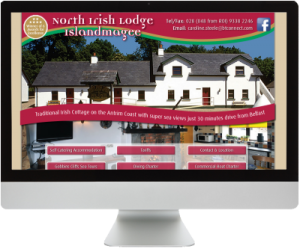 North Irish Lodge is located only 30 minutes drive from Belfast city centre and is close to all major airport and sea routes making it an ideal location for holiday makers or those wishing to get a few days away from the hustle and bustle of the city for a while. We developed a fun and attractive interactive site for the business which includes interactive maps and photo galleries as well as social media links. Caroline Steele from North Irish Diver had this to say about the service we provided to her company. I found Andrew pleasant, polite, understanding and very tolerant. It is a pleasure to work with him. His understanding of our product was excellent as was the interpretation of our marketing requirements. A good job well done. I would have no hesitation in recommending his work. Thank you Andrew and carry on the good work.